In February 2014, Ukrainian President Viktor Yanukovych was ousted after months of protests sparked by his abrupt decision – under pressure from Russia – not to sign a trade pact that would have drawn his country closer to the European Union. A few weeks later, Russia annexed the Ukrainian oblast (region) of Crimea, and soon after, rebels started an insurgency in two eastern oblasts of Ukraine, Luhans’k and Donets’k. Since the fighting started last year, Western countries have imposed economic sanctions on Russia, which has led to a period of worsening relations between Vladimir Putin’s Russia and the West. A new Pew Research Center survey looks at the conflict through the eyes of eight NATO countries (U.S. and Canada, plus six EU nations) and in Ukraine and Russia to gauge what ordinary people think about the crisis. Because of security conditions on the ground, the Ukraine survey includes all regions except Luhans’k, Donets’k and Crimea, or roughly 80% of the population. For more on the issues with conducting a survey in Ukraine during a time of conflict, see here. 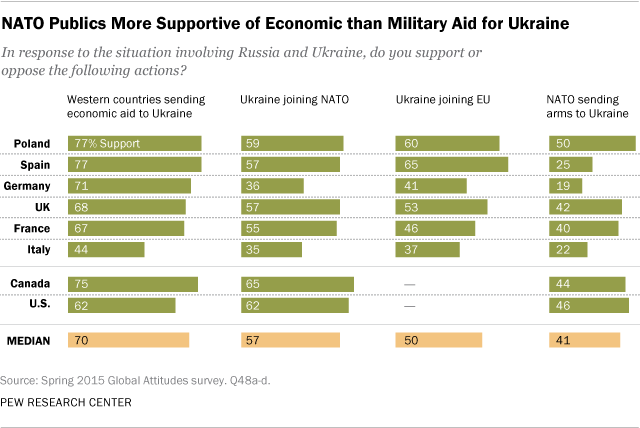 1NATO publics support economic aid, but do not favor arming Ukraine. Most people in the eight NATO countries surveyed (a median of 70%) are happy to see Western countries send economic aid to Ukraine. Many also support Ukraine joining NATO and, in half the EU countries surveyed, favor Ukraine joining the European Union. But people in these NATO countries made it clear that they did not support sending arms to Ukraine – a median of just 41% supported doing so. Skepticism about sending arms was highest in Germany, Spain and Italy, while support for arming Ukraine was more common in Poland, the U.S. and Canada. 2 NATO countries expect the U.S. to defend against Russian aggression. We asked people whether they thought their country should come to the aid of a NATO ally if that ally found itself in a serious military conflict with Russia. People in Canada, Poland and the United Kingdom thought their country should come to their NATO allies’ aid, but Germans and Italians took the opposite stance. A majority of Americans (56%) say the U.S. should use military force to defend a NATO ally against Russia, although more Republicans (69%) hold that view than Democrats (47%). When asked whether the United States would come to a NATO ally’s aid, majorities or pluralities in every country said the U.S. would defend the nation against Russian aggression. 3 The West and Russia disagree over what has caused the conflict. 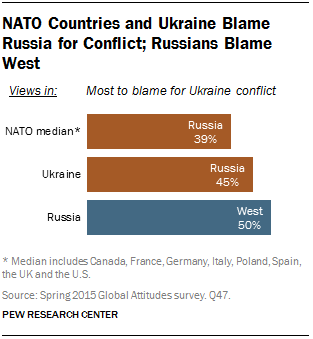 A median of 39% across the eight NATO countries surveyed say that Russia is to blame for the crisis in Ukraine, more than blame the pro-Russian separatists (median of 18%), the Ukrainian government (9%) or Western countries (7%). Ukrainians agree, with 45% blaming Russia for the violence in eastern Ukraine. However, half in Russia blame Western countries, such as those in Europe and the U.S., for the Ukraine crisis. Around a quarter in Russia (26%) blame the current government in Kyiv, but only 2% name Russia as the primary cause of the conflict. 4 Russians praise Putin despite their country’s economic troubles. Views of the economy in Russia have soured over the past year, as the fall of oil prices and ongoing economic sanctions imposed by the West have taken their toll. Still, Russians overwhelmingly support President Vladimir Putin’s handling of relations with foreign powers, such as the U.S. and the EU, as well as his handling of the Russian economy. And 62% even praise Putin for his performance on corruption. Nearly nine-in-ten (88%) Russians have confidence in Putin to handle international affairs, including 66% who have a lot of confidence. 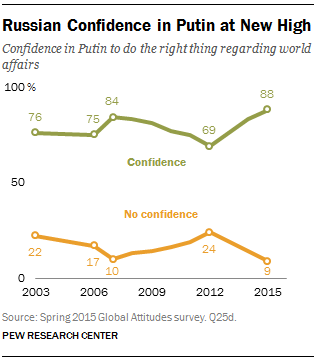 Overall confidence in Putin is up 19 percentage points since before the start of the Ukraine conflict. 5 As positive views of the Russian state surge inside Russia, opinions of Germany, the EU, the U.S. and NATO have turned dramatically negative since 2011. In 2015, only 15% of Russians have a favorable opinion of America, down from 56% in 2011. And about a third in Russia (35%) see Germany favorably, less than half of what it was in 2011. Similar declines are seen in Russian views of the EU and NATO in the past few years. 6 Russians and Ukrainians disagree on what to do about the regions in eastern Ukraine, where the separatist movement has been the strongest. Ukrainians would like the Luhans’k and Donets’k regions to remain part of Ukraine, either with the same terms as before the conflict (51%) or with more autonomy from Kyiv (33%). But Russians prefer that the region either become independent states (35%) or part of Russia (24%), rather than stay with Ukraine (32%). 7 While 85% of Ukrainians would like to remain one, united country, they prefer negotiations as the path leading to such an outcome. Nearly half (47%) in Ukraine would like to negotiate a settlement with separatists and Russia, while only 23% would prefer to use military force. Those Ukrainians in the east of the country, living outside of Luhans’k, Donets’k and Crimea, are more likely to want to engage the separatists compared with those living in the west.